Central Channel Release is an effective, profound and unique therapeutic bodywork, which will take your practice to the next level. It develops aspects of shiatsu by fusing specific touch contacts and energetic work with membrane releases, fascial unwinding and soft-tissue structural alignment. When we encounter stress/trauma, if unresolved the energetic pattern or memory of this stress is held in the body tissues. A person’s energy or Life Force literally becomes locked into the Stress Pattern as though the original stress was still happening. This creates physical, emotional and psychological problems and prevents us fulfilling our potential in the present life situation. The Central Channel course teaches you to identify and release 6 specific stress patterns, to let go of past traumas and future anxieties to become more functional in the present moment. This is a powerful tool to achieve new levels of health and freedom in the body and life. Prepare to be challenged and embark on an exciting journey of personal development! 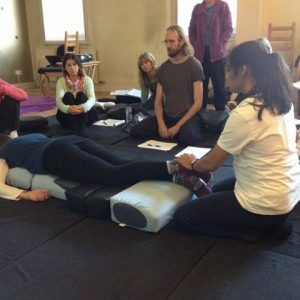 This is a professional development course for shiatsu, craniosacral, massage therapists, structural therapists, reiki and other healing bodywork practitioners. Many people also attend for their own healing or personal development.